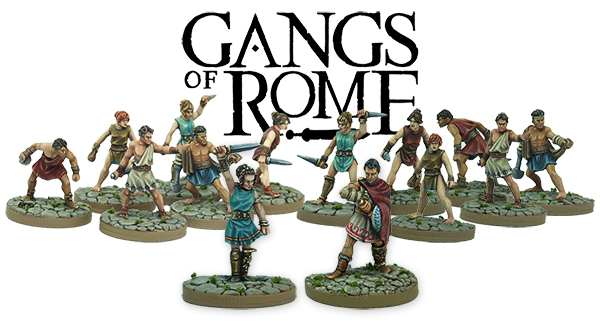 Warlord Games releases Gangs of Rome, an innovative 28mm Skirmish game for the sharp of mind and bold of action. Inspired by the history of the great city, Gangs of Rome takes place in the shadows of the Empire where the heads of ambitious houses have gathered fighters forged hard by the streets to do their bidding and enact their schemes. As a Dominus, the head of a house of Rome, you will seek out the most brutal of Romes criminal denizens, plying them with the promise of wealth and glory should they aid you in your plan to rise to the Senate of Rome and cast down all enemies before you. Closing about you like a ring of steel your gang will arm themselves and take to the streets and alleyways of the city, advancing your interests and crushing your foes. Your strategies mixed with their savagery, mind and sword as one as you carve your name across the very pages of history.